The Power of Goals. : Evolution or Relegation. It was hard to appreciate the unconventional potency of Rory Delap's long throw unless you witnessed it in the flesh and particularly early in Stoke's Premiership years. Low and flat, with little hang time, it presented a unique challenge to defences that were used to a more leisurely approach to repelling crosses. Keepers were especially hesitant and many found themselves rooted to their lines, attempting to keep out powerfully deflected headers that often originated from little more than the edge of their six yard box. Few teams enjoyed the attacking experience served up by Stoke, none more so than Arsene Wenger, who chose to call for an amendment to the throw in law, rather than attempt to develop an effective method for defending against Delap's slingshots. Of course, Delap was just a part of the Stoke experience, where possession was shunned, opponents harried without a loss of defensive shape and when Delap retreated to the bench, wide deliveries and set plays were employed to fill the void. 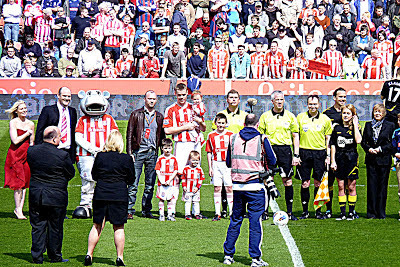 In short, Stoke presented a unique challenge for established Premiership sides that were used to pitting their footballing skills against opponents with similar aims and ambitions. Some made heavy weather of adapting to the challenge. Delap himself has gone on record as saying that although sides did struggle to cope with Stoke's style, especially his throws, adapt they did and the relatively successful strategy gradually became less so. However, Tony Pulis, the mastermind behind the Potters' survival strategy was a reluctant innovator and a considerable rump of his tactical creation remained a prominent part of Stoke's approach until club and manager finally cut the ties after five eventful seasons. 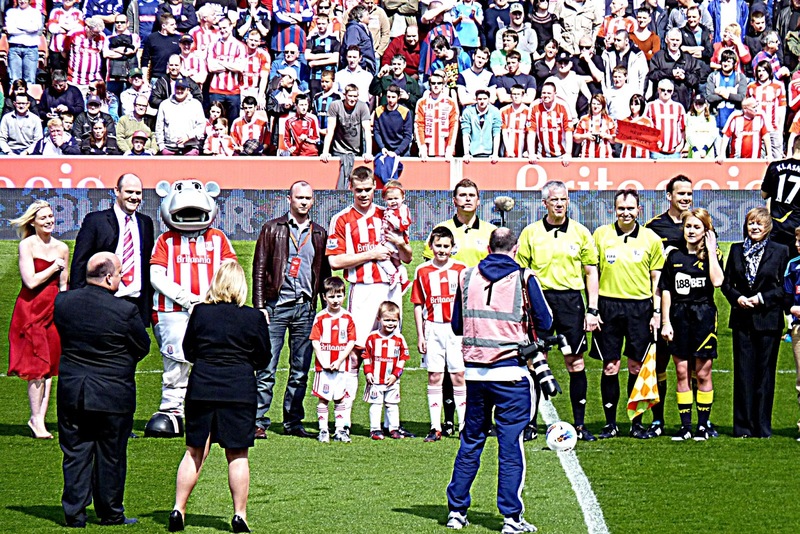 When Stoke slightly surprised themselves and many of their supporters by claiming automatic promotion in May 2008, they did so with a positive goal difference of just 13 or under three tenths of a goal a game. Sides that progress from the Championship to the Premiership, overall see their average goal difference per game slide by around a goal. So Stoke's projected goal difference in their inaugural Premiership campaign was a paltry minus 0.7 of a goal per game and that has traditionally been only good enough for penultimate place and relegation come the end of the season. That they comfortably over achieved on that projected total by finishing 12th with an actual goal difference per game of -0.44 of a goal, in the process beating all market predictions, was in no small part down to the difficulty opponents experienced in trying to cope with Stoke's wildcard, the extreme long ball tactic, coupled with an aerial, set play bombardment. Over the period of their Premiership tenure, Stoke have claimed 225 league points against bookmaker odds based model predictions of 216 and if we take out the first season, model predicted actual outcome accurately to within a couple of points. But does this mean that Delap's assertion that sides were gradually coming to terms with Stoke's style is undermined ? The bookmakers odds for Stoke matches over the period offer a good proxy for a robust predictive model. Small sample noise can often make a side appear to decline or improve when in fact little has changed, but all good odds setters realise this and so longterm reality usually sits well with longterm, actuality. However, it is also possibly that errors on one side of the ledger can balance errors at the other extreme to create an illusion of accuracy where rather the opposite exists. In the graph above, I've plotted Stoke's under or over-performance against a bookmaker's model expressed in league points per game based on the number of times their opponents had gone through the unique experience provided by Pulis' side over the 190 EPL games played by the Potters. The general trend appears to support the realization of one player, if not the manager, that sides had increasingly worked Stoke out. 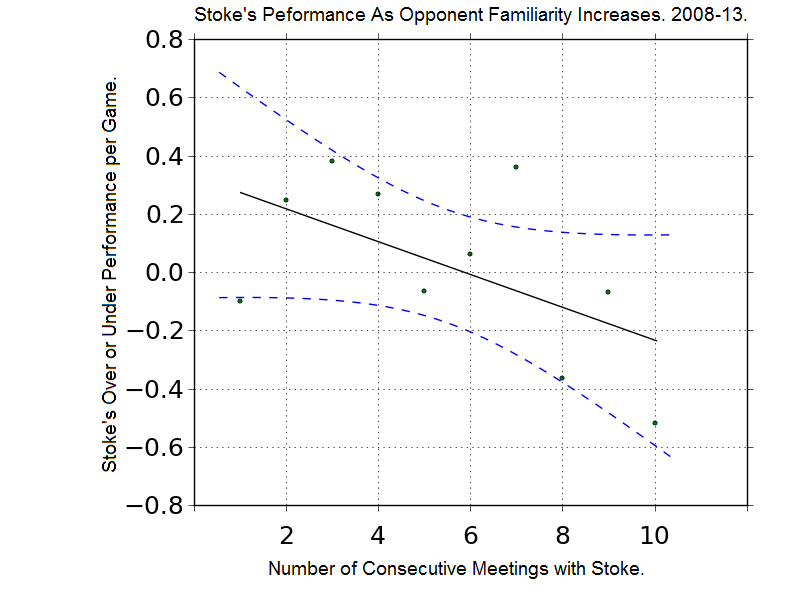 A group of teams meeting Stoke for the second or third time were allowing Stoke an average of three tenths of a point per game more than a robust, but general bookmaking model would predict. But by the time the mutual meetings had risen to ten Stoke were now the under performing outfit to the tune of nearly half a point a match. Familiarity, in the absence of much, if any tactical evolution from a Pulis led Stoke had bred success for their opponents. Fortunately for Stoke's survival, promoted sides were constantly refilling the left hand side of the plot and continued over performance in that area was keeping Stoke afloat, although the margins for error were bound to become even tighter as old Premiership friends, such as West Ham, WBA and Newcastle began to rejoin mid plot. Stoke include a rare innovation in their Premiership starting 11. Anecdotal evidence from a player appears to be backed up by the data and hints at the need for teams to constantly evolve or decline. Many Stoke fans and one chairman realized during this season that the only two possible outcomes from a stagnating Stoke style was relegation or managerial change. Sides can sometimes poach a decisive advantage by utilizing such simple measures as better fitness levels, but they quickly drop back into the pack as others catch up and novel tactics carrying an element of surprise soon become stale as opposing coaches work out a solution. The best managers never let their sides stand still for long. QPR's Poor Shot At Staying In The Premiership. Wide Right. How The Lions Hung On In Brisbane. Scoring Efficiency and Game State. Shot Blocking From Corner Kicks. Is Shooting Easier On The Road? Leigh Halfpenny's Perfect Ten (+1). Where The Talent Shone Through In 2012/13.